This article is about the Sonic Chaos enemy. For the game, see Frogger on Sega Retro. Frogger is a variety of badnik created by Dr. Ivo "Eggman" Robotnik, encountered by Sonic and Tails in Sleeping Egg Zone during Sonic Chaos. 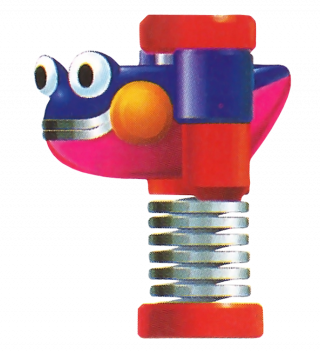 In keeping with the pogo theme of the level, Froggers resemble frogs' heads stapled to some sort of large mechanical jackhammer. Frogger models have no proactive offense; they simply bounce relentlessly forward, damaging Sonic if he bumps into them. Froggers are easily dispatched by a spin attack. Like other robots in 8-bit Sonic games, no animal friends pop out of Froggers when they are destroyed. Whether these badniks canonically don't contain organic batteries, or the escaping critters simply weren't shown due to programming limitations, is not known. This page was last edited on 3 April 2018, at 13:42.